The Jewish tradition of building a Sukkah in the fall has, over the last 10 years or so, gained real momentum in our city. I often wish faith and religion were laid out like a smörgåsbord where one could pick holidays, lessons and practices from whichever ones appealed to you the most. In this imaginary spiritual cafeteria, one of the Jewish traditions that I would take a big helping of would be the Sukkah. The Sukkah tradition appeals to me in a lot of different ways, the primal fun of being out of doors in the beautiful New England fall, the time for the contemplation and retrospection which comes so naturally during this time of year and of course family and friends. Sure, I could absolutely do all this without the faith aspect on a camping trip or other outing, but there is something different about a religious tradition. For example, the fact that you feel obligated pretty much ensures nearly everyone's participation, largely without griping. I suppose after building dozens of Sukkah's over the years that it would get old. I can see how the last thing I would want to do when I came home tired from work, would be to go outside in the cold and dark to build yet another Sukkah. But I would do it anyway, and that's precisely the point, because later, I would be glad I did. 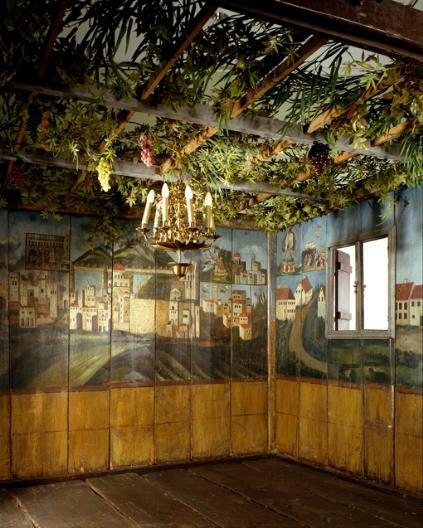 The beautiful Sukkah pictured above is from 1930's Germany and is in a Jerusalem Museum.